Hello Dear Readers! What shall we do today? Hm . . . Oh I know! Let’s look at how Moms have been portrayed as Brain Dead through the decades. 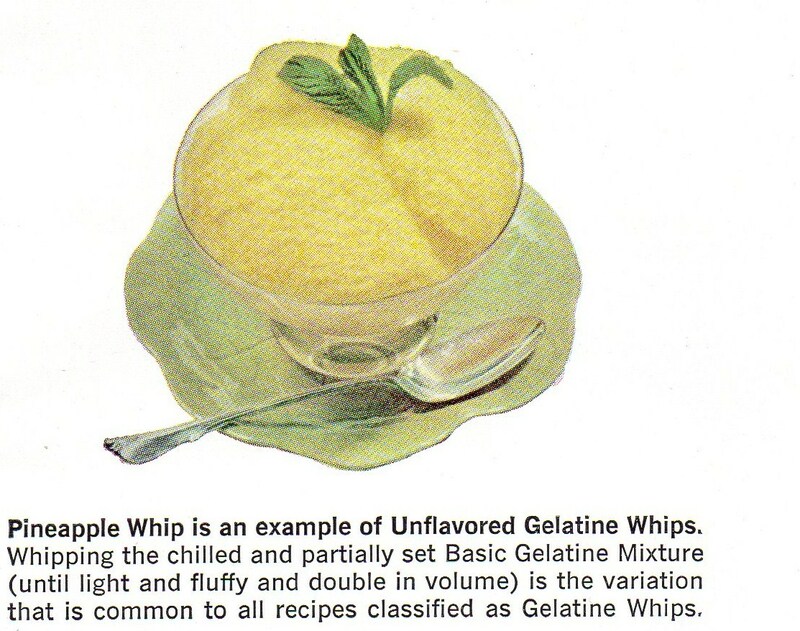 As it just so happens, I found a few vintage cookbooks that we can use to contrast and compare. Poor Brain Dead Mom from 1937! It looks like she might have infused just a tad too much personality into her baked goods. So much so that they are now holding her hostage. And is her shadow sprouting a horn? Oh my! But somehow Brave Brain Dead Mom of 1937 still manages to smile even though she can’t quite hide the terror in those vacant peepers of hers. Ah! Brain Dead Mom from 1953 is clearly relieved and happy now. The War is over! Hitler’s dead! 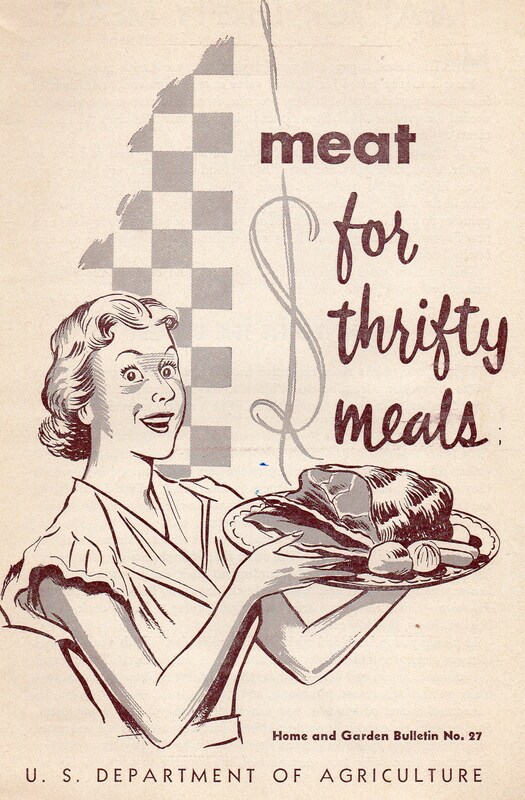 And, judging from her eyes, her doctor just prescribed a lifetime supply of Seconal for her anxiety as well as Benzedrine to be taken every ten minutes to ensure her waist circumference stays at 11-and-1/2-inches. 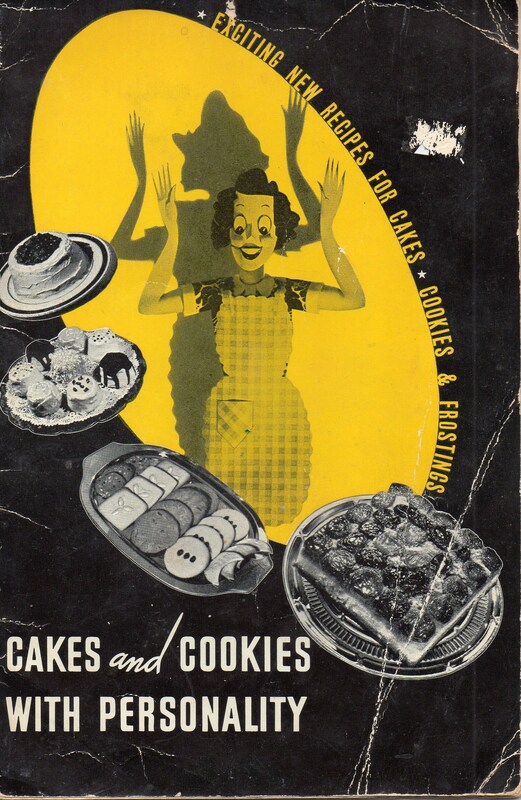 Which gives Brain Dead Mom from 1953 lots and lots of energy so she can dedicate her entire existence to cooking and cooking and cooking and cooking and cooking and cooking and cooking and cooking and cooking and cooking and cooking and cooking . . . Brain Dead Mom from 1959 has her act together! No more cowering in the horn-sprouting shadows from her baked goods. No more mindless cooking and cooking and cooking. No sir! 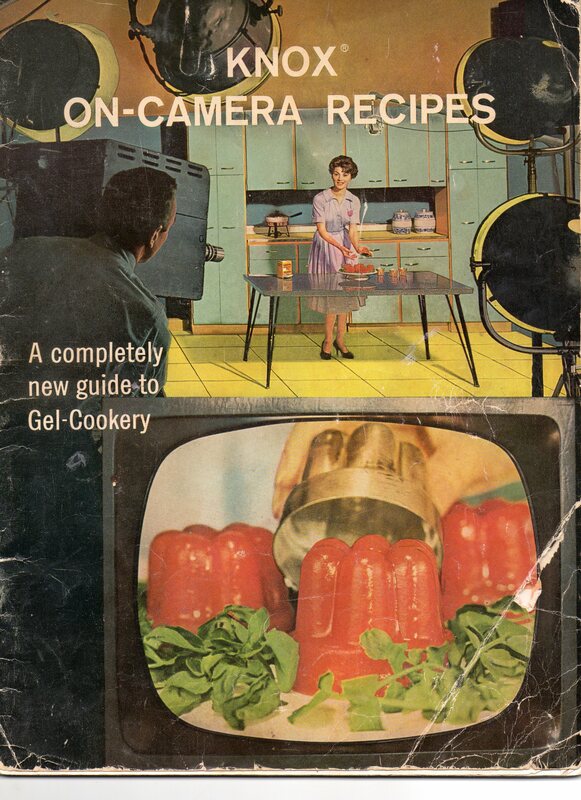 When one gazes into the eyes of Brain Dead Mom from 1959, one can clearly detect a Valium-induced, vague optimism for the future of her country, the future of her family and the future of her green pepper. 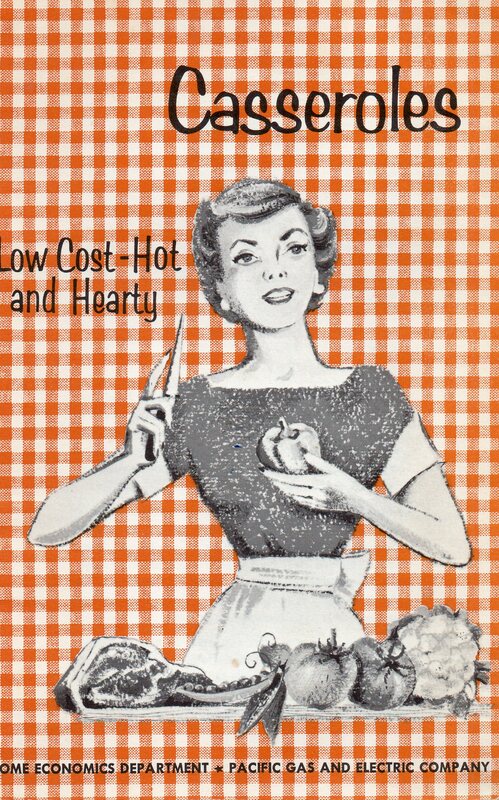 Clearly Brain Dead Mom of 1959 is a more confident women than her predecessors. Why? Because she doesn’t know any better, that’s why! A Ring a ding ding, Baby! Brain Dead Mom from 1965 has it all going on! She doesn’t even have to open her eyes anymore! Oh sure she’s still popping a few “bennies” now and then, but come on! 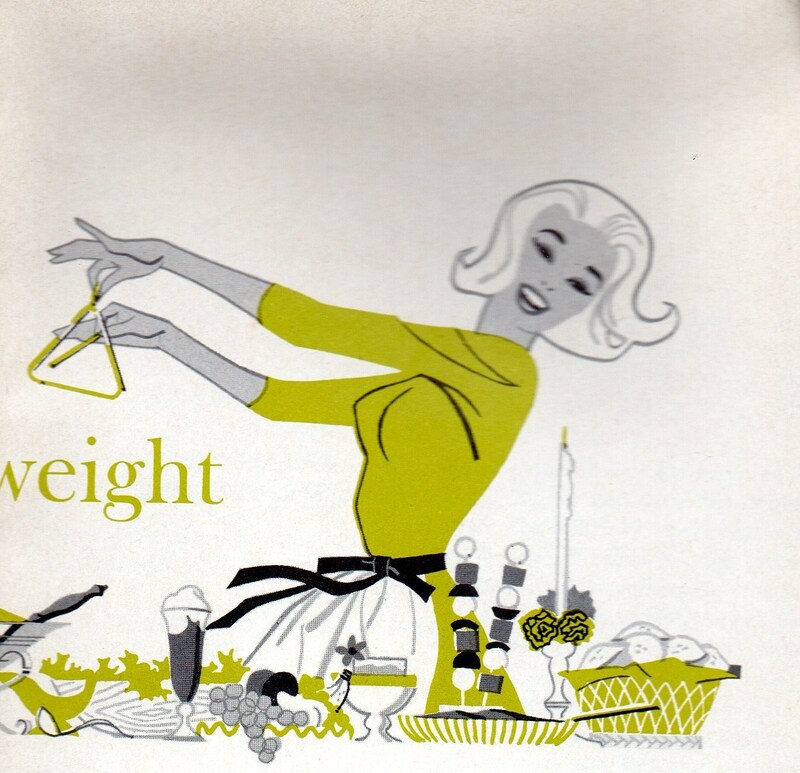 How else is she going to maintain her 11- and-1/2-inch waist what with all the food she’s been eating and all those martinis she’s been swilling with her new devil-may-care attitude? 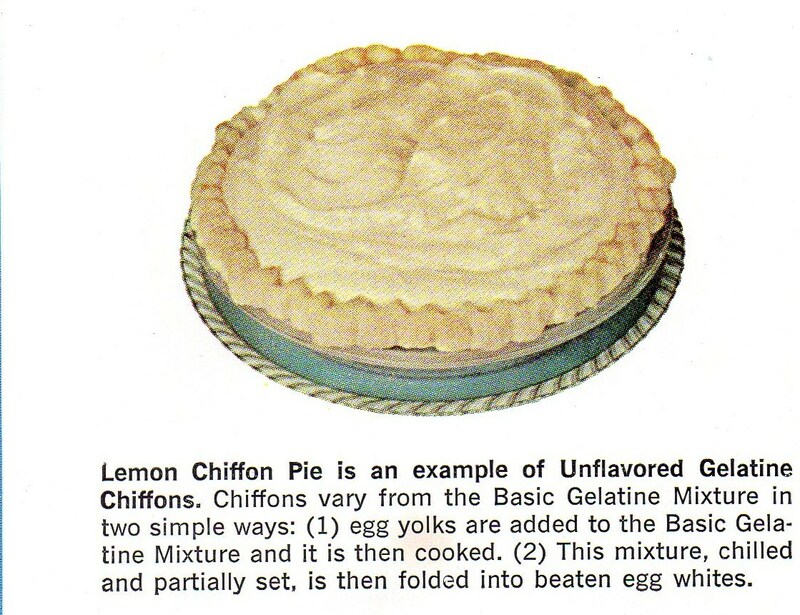 Brain Dead Mom from 1965 would never cower from her own baking! Ha ha! Don’t make her laugh! Because Brain Dead Mom from 1965 has a life! She’s fancy! 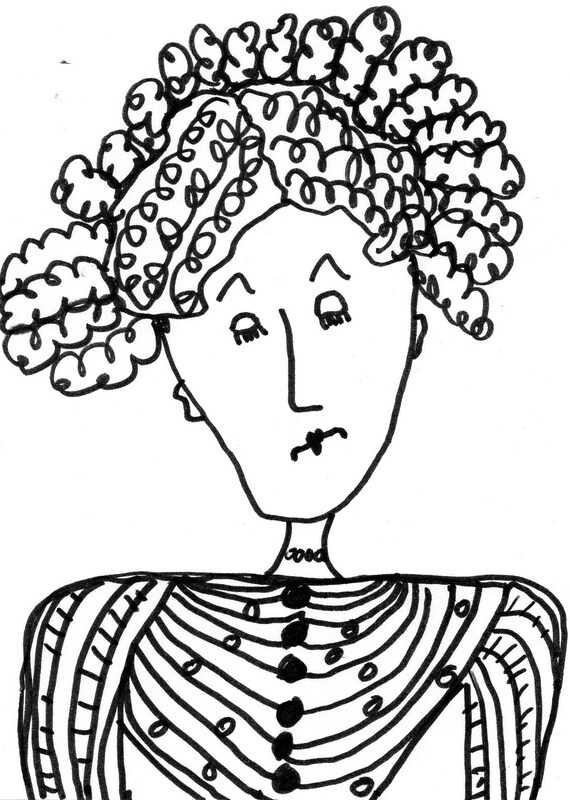 She’s frivolous! She’s fun! And somewhere along the line she learned to play the triangle! I have a feeling there are lots and lots of other examples of Brain Dead Moms Through the Decades out there on the shelves of my favorite thrift store! And I make this pledge to you, Dear Readers, that I will not rest until I have messed up everything on the shelf looking for them! . . .. and cooking and cooking cooking and cooking and cooking and cooking and cooking and cooking and cooking and cooking and cooking and cooking and cooking and cooking and cooking and cooking and cooking . . .to be continued . . . 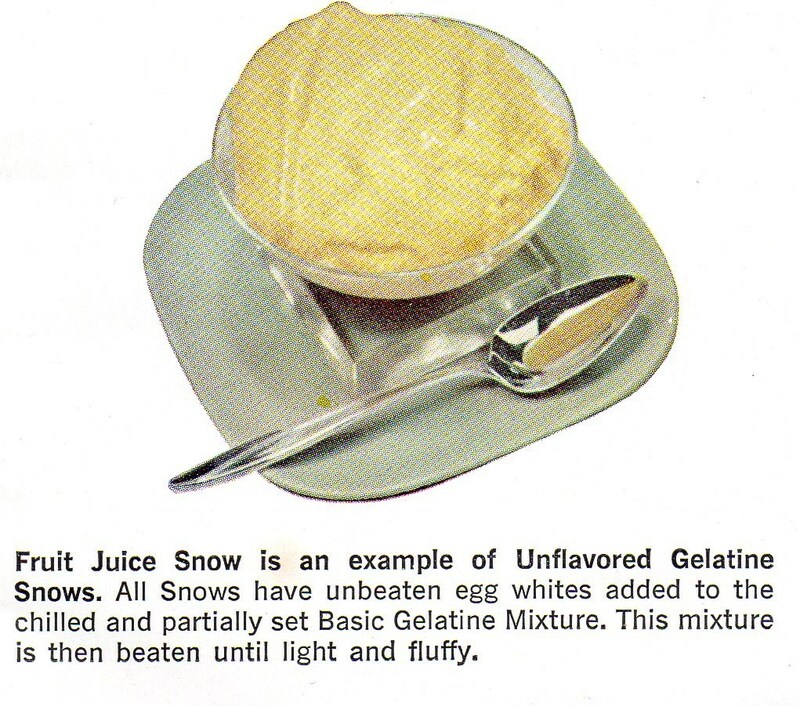 The Magic of Olives with 35 delicious new recipes from 1958! Legend has it that back in 1958, a brave Madison Avenue Advertising Executive hitched a ride on a steamboat to a land called Spain where he promptly fell into a siesta (which loosely translated means asleep) under a Spanish Green Olive Tree. When he awoke, he was famished and picked a Spanish Green Olive off a branch of the tree, thinking it a very strange little Spanish apple of some sort and popped it into his mouth after which he exclaimed “Ay Carumba! And viola! just like that the Imported Spanish Green Olive Industry of 1958 was born! 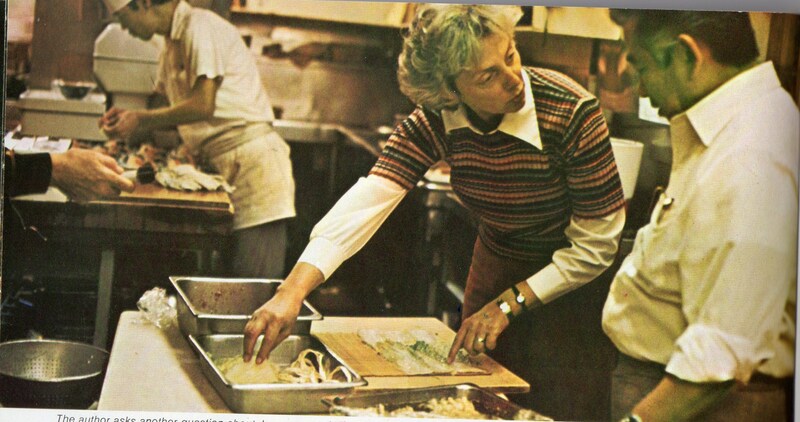 The next thing you know, Imported Spanish Olives of 1958 were spicing up practically every dish in America, Canada, and most of Nova Scotia in concoctions like Hacienda Chicken. In this dish, we are experiencing the joy of Imported Spanish Olives as they siesta (see above for translation) atop an unmade bed of rice — lending much-needed pizazz to the orange objects which deductive reasoning tells us must be the Hacienda Chicken! 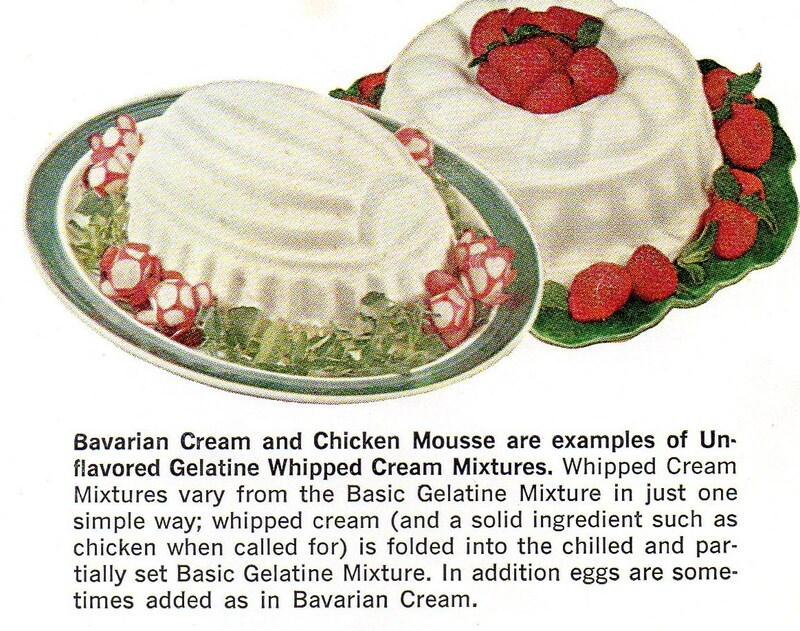 In this dish, North Americans of 1958 could experience the magic of the noodle-salmon- olive teaming the likes of which hadn’t been experienced since the Spanish Conquistadors threw After Conquer Parties in the corridors of the Nina, the Pinta and the Santa Maria! And notice how the Imported Spanish Olives lend an air of importance to the salmon. Surrounding it as if to say, “I’m circling you Mr. Senor or Mr. Senorita! What this sandwich lacks in imagination it makes up for in Imported Spanish Olives! 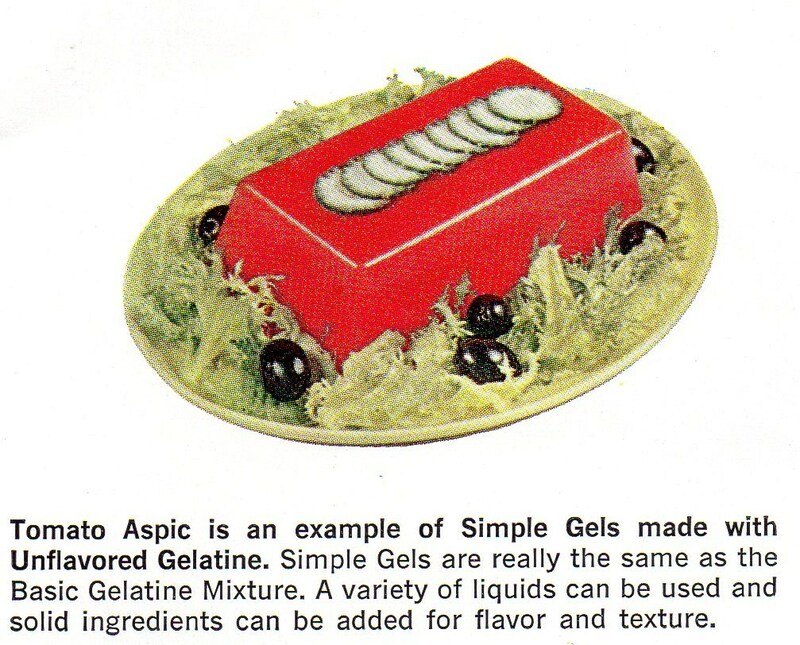 The idea being that even the simplest of North American dishes of 1958 could be made just that much better through the stacking, piling and/or slathering on of Imported Spanish Olives! And if this doesn’t make the average household of North American want to run to (or possibly from) the dinner table, the Imported Spanish Olive Industry of 1958 doesn’t know what will! Adventures in 1941 or Drunk as a Skunk Wearing War Time Trousers! Sometimes things just keep getting better. 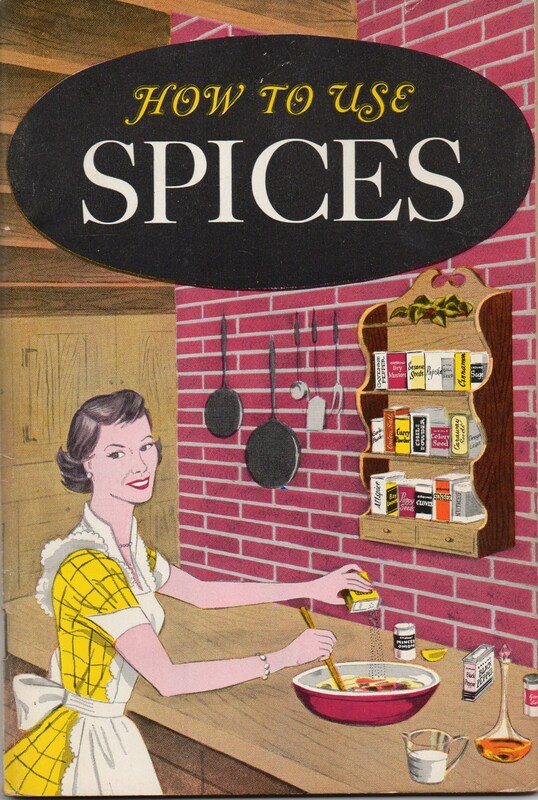 I opened one of my vintage cookbooks this morning and guess what I found folded up neatly inside? A section of a newspaper from May 12, 1941, almost 60 years ago to the day! Apparently back in 1941, people had a lot of excessive ugly hair which was not to be confused with plain ol’ ordinary ugly hair. Because in 1941, everybody’s hair was ugly, that goes without saying. But apparently, it was only the excess ugly hair that they were worried about. 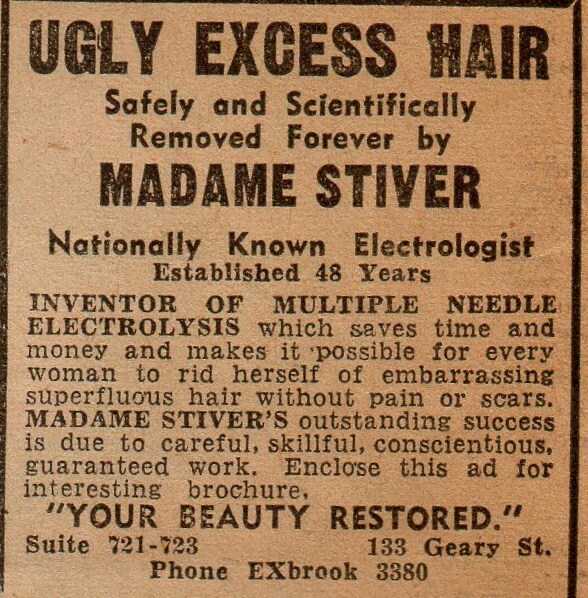 And apparently if you wanted this excessive ugliness eradicated, you had to go to a Gypsy Fortune-Teller/Seance-Conducting Madame where you could get your offending follicles removed scientifically using multiple needle electrolysis on your superfluous (and uncalled for!) hair. Ah! 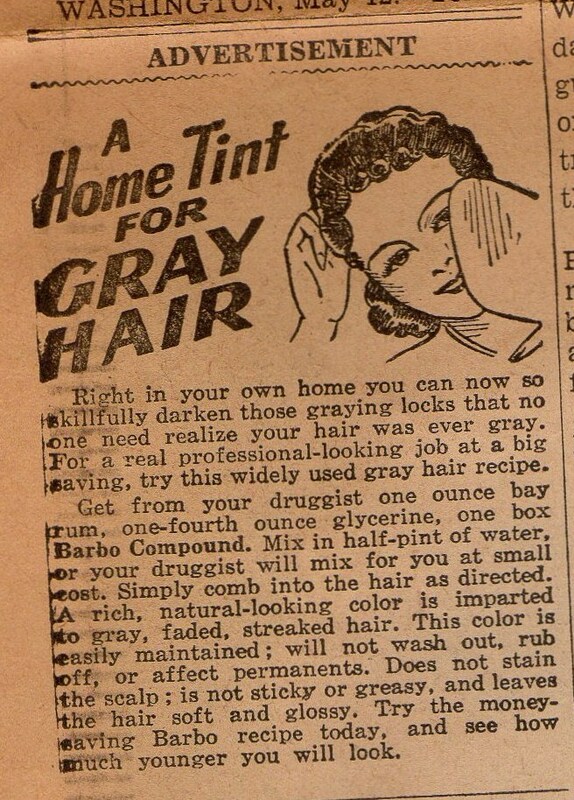 Back in 1941, nothing gave hair that natural healthy glow like Bay Rum, Barbo Compound, and half a pint of water. The ad says to try the recipe today and see how much younger you will look — assuming you fore go applying it to your hair and just chug it! Heh? This one is a little tricky to figure out. Let’s see . . . there’s a war going on . . . so therefore men’s vests don’t match their pants anymore . . .. so they have to send their vests to the Pants Matching Co. . . so they can make a vest to match their pants which are now called “Wartime Trousers”. 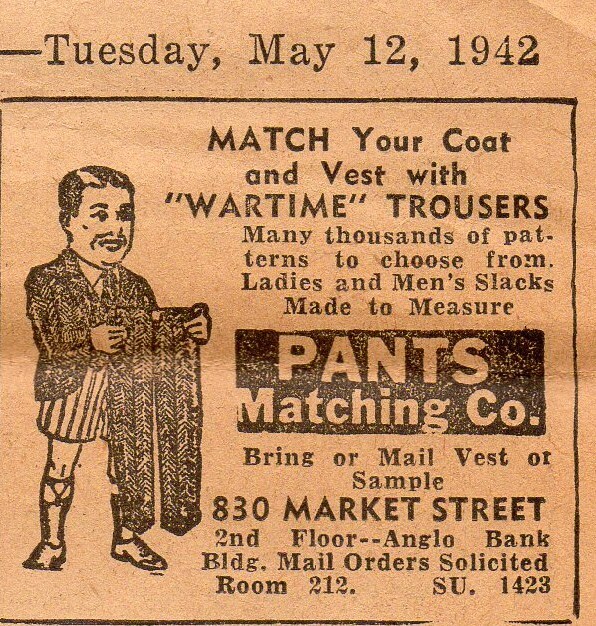 And even though the gentleman in the ad has an abnormally large head, he apparently doesn’t have an abnormally large brain — because if he did, why has he taken off his “War Trousers” when he’s suppose to be sending The Pants Matching Co. his vest? 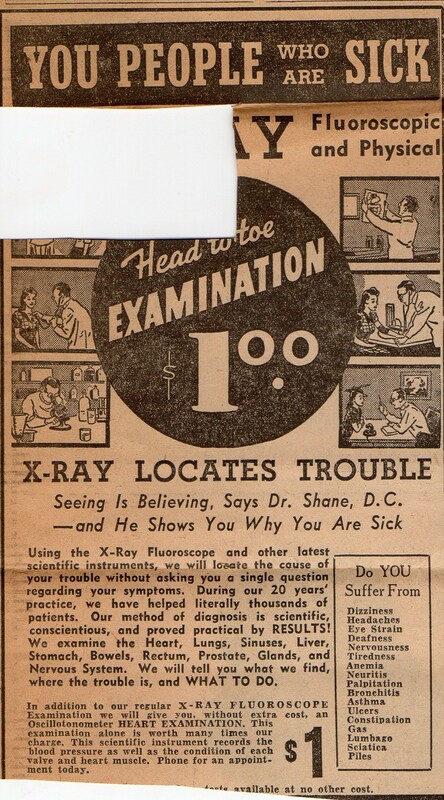 Well thank goodness there was at least one Dr. Shane D.C. practicing medicine without a license back in 1941! And not only did this guy somehow get a hold of an X-ray machine, he’s going to diagnose you without asking you a single question! Talk about saving time! Of course it’s going to cost you one, hard-earned dollar, so you might not want to do it. But wait . . . .what if he throws in a Oscillotonometer heart examination and what if he capitalized HEART EXAMINATION in the newspaper ad? Would it be worth your hard-earned dollar then? Still no? But what if you suffered from something on the list of symptoms like Deafness or Lumbago or, heaven forbid, Piles? What then? You mean to say you would have actually walked around town in 1941 wearing an ill-matching Wartime Trouser/vest combination with your ugly excessive, hair sticking out everywhere –drunk as a skunk from ingesting the Barbo hair dye recipe — with extra rum? OK fine go ahead . . .but I’m telling Madame Stiver on you, so watch out!